Stand up and close your eyes. If you have superpowers and managed to memorize this text before doing so, you'll be now reading it in your mind. Now, try to walk straight for two meters towards somewhere with no walls or obstacles. This is not an experiment about pain. Stop, turn around 180 degrees, walk two meters again and open your eyes. If you don't suffer from a proprioceptive disorder, you should be close to your initial position. Obvious, right? Perhaps it is for humans but, since a few years ago, it was not easy for robots. In order to know their spatial orientation and keep balance, robots use Inertial Measurement Units (IMU). They are composed of accelerometers, gyroscopes and, sometimes, magnetometers that measure linear accelerations, angular rates and magnetic fields, respectively. The measurements of these components are fused together with a Kalman filter or a complementary filter to have a pretty accurate estimation of the IMU attitude. By only measuring accelerations and rates, it would not be possible for an IMU to give an absolute attitude measure. However, accelerometers can sense the gravitational field and magnetometers can know the direction of the Earth's magnetic field, so the IMU can build a reference frame for the attitude measurements. Thanks to MicroElectroMechanical Systems (MEMS), the components in an IMU today can be embedded into chip-like casings and consume very low power. This opened the door some years ago to the inclusion of IMUs in portable devices. In fact, I would dare saying that absolutely all smartphones today have an IMU. If only they had also powerful processors, cameras, data connections, low power consumptions and affordable prices, they would do great as basic robot controllers... Oh, wait! 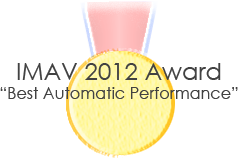 A few days ago, I was wondering how good the performance of the IMU in my iPhone 4S would be. Would it be accurate enough for robotic applications? Would it help with self-localization? Would it be good enough to put on a quadrotor and do this? I wrote a simple app to check it out and recorded some tests. Core Motion is the iOS framework that provides access to the IMU. Before starting to read the documentation, I was expecting something rough. Something like having to directly read the accelerometers, then fusing with the gyros and so forth. Nothing further from the truth. Apple packed the whole process in the Core Motion framework, so you can do everything with a few lines of code. However, you still can do it the hard way if you want because Core Motion also gives lower level access to the IMU components. A potential scenario where low level access could be useful would be the fusion of the IMU information with the GPS data in a tightly coupled Kalman filter. The dice is rendered with OpenGL. The camera is captured with OpenCV and each frame is copied to a texture covering a quad at the background that is always parallel to the camera image plane. Before being copied to the texture, the camera frames are cropped to keep the same aspect ratio as the phone's screen to avoid distortion. The background texture dimensions are chosen as the minimal power of two enclosing the cropped background. The texture coordinates for the background quad are set so that the texture piece containing the camera frame covers the full screen. The rest of the post will only cover the aspects related to the linear algebra required to produce the "steady dice" effect from the attitude measurements. Other issues, like setting up the OpenGL context, framebuffers, models, textures, etc. will not be described, as they were not my main concern for this experiment. Feel free to fork the source code instead. All the visuals are generated with the good ol' OpenGL ES 1.1 pipeline. Despite it is easy and fast for simple applications, I would recommend learning the much more flexible OpenGL ES 2.0 pipeline with one of the many good tutorials on the Internet. As you have seen in the video, my sample app makes the dice look like its attitude stays aligned with the world reference, no matter how the iPhone moves. As the dice attitude is "fixed", you can explore its faces by moving the phone around it. 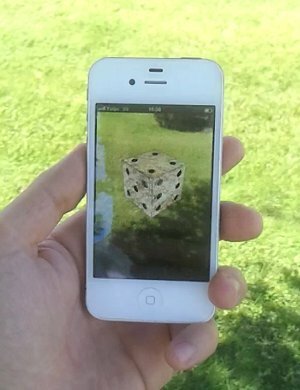 This is achieved by rendering the object as if it is viewed from a camera that moves exactly like the iPhone in the world frame. Please observe my matrix notation. I write every transformation matrix as a T with a superscript and a subscript. The subscript denotes the source reference frame and the superscript indicates the target reference frame. Hence, the projection matrix is the transformation matrix from the view reference frame (v) to the screen reference frame (s). And the model-view matrix is the transformation matrix from the model reference frame (m) to the view reference frame (v). Notice that I am using screen instead of viewport so the abbreviation is not confused with the view reference frame but, in fact, viewport would be a more correct nomenclature, as the projections can live in a window or other screen subspace. This function is called with the angle of the field of view in the vertical direction, the aspect ratio of the viewport and the distance of the near and far clipping planes. The output is a transformation matrix that describes something similar to a depth-bounded pinhole camera model. It is equivalent to gluPerspective() in GLUT. By reading the device motion with Core Motion, we get a rotation matrix that expresses the device attitude in the selected IMU reference frame. This reference frame, for our case, has the Z vector pointing up the sky. The X and Y vector directions are not specified, but I have experimentally verified that the Y vector points towards where the phone top was when the app started, whereas the X vector points towards where the phone right side was at that same moment. The advantage of this expression is that the computationally expensive inverse operation can be skipped by simply transposing the rotation submatrix and negating the translation vector. Why to use GLKit matrix operations? Can't you do it with OpenGL? In fact, you can, but I just wanted to point out that we can use some useful GLKit functions for the same purpose without the drawbacks of working with the OpenGL matrix stack. The code will be easier to read and more flexible, as you won't need to take care of OpenGL's state by pushing and popping the matrices every time you want to operate on them. Is it for free? Nope, you will pay in lack of portability because GLKit is not available outside iOS. Anyway, it's good to know that it's there. Your first impression on the model-view matrix definition above might be "the element order is wrong". It is a very common mistake and it means that you are thinking in row-major order. Just notice that matrices in OpenGL, GLKit and Core Motion are treated as column-major. The first four coefficients passed to GLKMatrix4Make() are the first column, the next four coefficients are the second column, and so on. In the same way, each member mij of the CMRotationMatrix is the element in column i and row j. If you take a look again thinking column-major, you will see that the second line in the code above actually represents equation VII. We have explored how to read the device attitude on iOS and how to do something meaningful with it thanks to linear algebra, the GLKit framework and OpenGL. After doing this experiment, I am convinced that the IMU in the iPhone 4S would do a good job in many robotic applications. Even when the magnetometer is enabled, I have noticed a slight drift in the yaw angle. However, without going into quantitative results, the accuracy and the response time figures that I have experienced are comparable to those offered by the IMUs in some quadcopters that I have used in the past. In conclusion, I guess that I will give the iPhone a try as a robot controller as soon as I can. Have you used your smartphone's IMU for some project? Did you try it on Android? Do you have any tips or want to share your experience? You are very welcome to comment below.